Yesterday was another magnificent cycling day! Kieran and Alberto had signed on for the 160k Cork Rebel Tour. 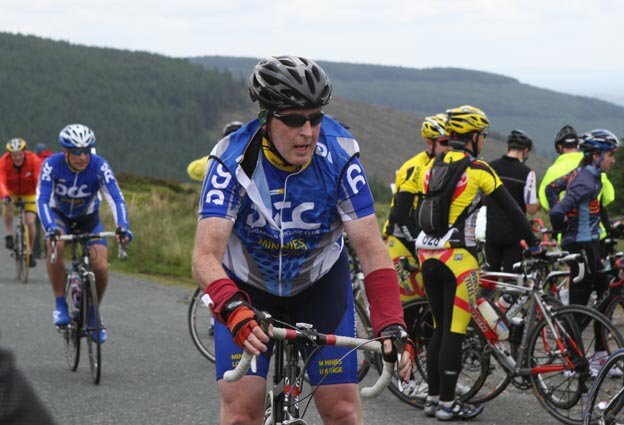 Apart from getting lost going out of Cork City and not seeing any bikers, stewards or signs for about 90 minutes, and apart from the fact that it was a terribly badly-organised event, I still consider that it was a magnificent event to cycle. In all fairness, the food at Dunmanway was really good, the tailwind to Clonakilty brought on a fast pace, and the scenery at the Old Head of Kinsale was worth the cycle alone! We laid eyes on a tall slim young lady in green doing her mandatory stretches at Dunmanway, and tried to slow the pace to get her into our group. But, apart from glimpses at several spots later on the course, she was having none of it! Kieran almost needed windscreen wipers on the inside coming home as the jokes and banter increased in intensity. What a finish! P: Can I borrow your ankle bandage…I need it for my head? K: No, it’s on my head. P: Not a problem. I’ll put stabilisers on bike. Same thing! Afterwards, I called in to Kieran’s for another breakfast, and then did the dog on it again in the afternoon as we shared several Budweiser with friends at home. All in all, a WONDERFUL biking season. 85 spins, 4400 miles January to today. We will probably take it easy until Christmas, and have plans for bigger and better next year. Maybe slower, but better.